Have your car’s brake system inspected annually, even if you don’t suspect any problems! Brakes are a normal wear and tear item for any car and eventually they’re going to need replacement. Avoid letting your brakes get to the “metal-to-metal” point, which usually means accelerating expensive rotor or drum replacement. Good fuel economy, performance, and low emissions are all interrelated for an efficiently-operating engine. Your car’s emission system keeps the engine running cleanly and efficiently in all sorts of operating conditions. If your car’s engine isn’t performing up to par or the “Check Engine” light does on, have it inspected immediately. Failure to do so can reduce your mileage per gallon of fuel or cause your vehicle to pollute. Your car’s emission system controls the emissions, exhaust and pollutants using an array of sensors, computerized engine controls and the exhaust components. The emission system substantially reduces harmful gases such as carbon monoxide (CO), unburned hydrocarbons (HC) and oxides of nitrogen (NOx), and prevents harmful gasoline vapors from escaping the fuel tank. 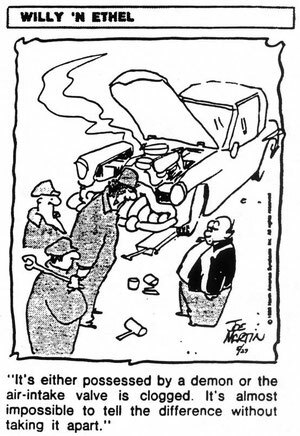 When a car or truck suffers major engine damage, the first reaction of most vehicle owners is to buy a new or used car or truck. This makes sense in some cases, but often, it isn’t necessary. Repowering your car or truck’s worn out engine with a rebuilt/remanufactured engine can also be considerably less expensive than buying a new or used car. A rebuilt engine is one that is remanufactured to prescribed standards and specifications by highly-skilled machinists using state-of-the-art equipment and components. During this process, many of the new components installed meet or exceed the original equipment performance standards. Frequently, rebuilt engines are superior to new car engines because better parts are used, or design changes in parts correct problems with the original engine. Rebuilt/remanufactured engines are dependable, reliable, and backed by warranty programs. The savings from engine repowering is notable when compared to the prices of new cars and trucks. A rebuilt/remanufactured engine purchased and installed at an average cost of $2,500-$3,500 is a sound and attractive investment. Typically, a professionally rebuilt engine comes with a one-year or 12,000 mile warranty but some of these warranties can be as long as 36 months or 36,000 miles. The key parts of the cooling system remove heat from the engine and automatic transmission and dissipate heat to the air outside. The water pump circulates coolant through the engine. The coolant absorbs heat then returns it to the radiator where heat is dissipated. The thermostat regulates the coolant temperature to keep it consistent for efficient engine operation. Carbon monoxide from your car’s exhaust is odorless, colorless – and lethal. If you have any suspicions of a leak, have it checked out at once. The exhaust system routes dangerous exhaust gas from the engine out and away from the car to keep from affecting the occupants. Next, the exhaust system reduces exhaust noise from the engine. The catalytic converter reduces the level of harmful pollutants in the exhaust. Finally, the oxygen sensors mounted in the exhaust system monitor the level of exhaust gases to maintain efficient engine operation and to monitor the converter’s operation. Your car’s engine can use more than 10,000 gallons of air for every gallon of fuel burned, so it’s easy to see how big a job the air filter has. The oil filter traps contaminants allowing the oil to flow through the engine unrestricted. The fuel filter separates harmful contaminants that may cause problems with carburetors or intricate fuel injectors. The air filter traps dirt particles, which can cause damage to engine cylinders, walls, pistons, and piston rings. The air filter also plays a role in keeping contaminants off the airflow sensor (in fuel-injected cars). The cabin filter helps trap pollen, bacteria, dust and exhaust gases that may find their way into a car’s ventilation system. Your car’s fuel system works with the rest of the engine control system to deliver the best performance with the lowest emissions. Check your car’s fuel system regularly or immediately if you sell gas or suspect a problem. The fuel system transfers fuel from the fuel tank and pass it through a fuel filter for cleaning before it arrives at the injectors. A pressure regulator controls fuel pressure to ensure good engine performance under a variety of speed and load conditions. Fuel injectors, when activated; spray a metered amount of fuel into the engine. Some vehicles use a return line system to return unused fuel back to the tank. Other main parts of the steering and suspension system include springs, pitman arm and idler arm. A transmission/transaxle keeps the engine’s output optimally matched to the speed and load conditions. The torque converter, connected to the automatic transmission/transaxle input shaft, connects, multiplies and interrupts the flow of engine torque into the transmission. Universal joints connect to the driveshaft to transmit output power from the transmission to the rear axle on rear-wheel-drive cars. Universal joints also allow the driveshaft to work at an angle. Automatic transmission fluid services a multitude of purposes. It cleans cools, lubricates, transmits force, transmits pressure, inhibits varnish buildup and continually protects the transmission. There are several different types of automatic transmission fluid. Reference your owner’s manual for how they should be used.